The mere thought of cooking for a crowd sends some people into full-blown panic attacks. Cooking for a dozen or more people in a home kitchen does present some challenges, but there is no need to reach for the Valium or martinis to ease the stress. 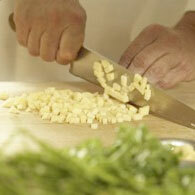 Most professional chefs do have the advantage over the home cook with regard to space and equipment. The greatest tool a chef uses however, is not a knife or a fancy oven, but their ability to logistically organize the event. The real challenge to the party host is how to put out an excellent meal and not be chained to the kitchen. The industry phrase for this is Mise En Place, meaning everything in its place. Good mise en place is not only having the food prepared, but your tools sharp and organized plus a detailed prep list, time line and a good menu. Menu planning is often the key to a successful holiday meal. If you have too many dishes that need last minute preparation, kitchen chaos will consume you. To avoid this, there are a few friends you can turn to. No, not Jack Daniels and Jim Beam. The crockpot. In the professional kitchen, chefs use a steam table to hold side dishes and sauces. The crockpot, which most people have hidden away in a corner cabinet, can act as a home steam table. Mashed potatoes can be made several hours in before the turkey finishes and held on low in the crockpot. This frees up valuable stovetop space for dishes that need last minute preparation. Pre-preparation can also save valuable last minute time. Blanching vegetables will allow you to serve green beans deserving of that moniker. Canned-green-bean casserole often occupies a space on the holiday table more for its ease of preparation than for its culinary desirability. Blanching is the partial cooking of an item that will be finished at a later time. For green vegetables, boiling salted water is needed as well as ice water to shock the vegetables and stop the cooking process. To properly blanch vegetables, cook until the desired color and texture is reached, slightly less if you are persnickety about your vegetables. Immediately drain the vegetables and run cold water over them in a colander a couple handfuls of ice will also help to quickly stop the cooking process. Drain the vegetables well and store the cooled vegetables in the refrigerator in covered containers. They can now be sautéed at the last minute retaining their freshness and nutrients. Sweet potatoes can also be partially cooked ahead of time. then baked in your favorite casserole recipe. With sweet potatoes and other root vegetables. slightly undercook and let cool naturally placing these types of foods in cold water just makes them soggy. Knowing what foods can be prepared ahead of time and safely held can be an invaluable tool for the home cook. Roasts, such as turkey and prime rib, are also time savers for the holiday host. If you are feeding a large quantity of people, think about two medium turkeys or rib roasts instead of trying to cook Birdzilla or Babe the blue ox in your home oven. Two 12-15 lb. turkeys can be fit in the same oven, side by side, and will take much less time than cooking a 20-plus pound behemoth bird. Another chef tip is browning flour in the oven for darker gravies and sauces. This step can be done days ahead of time and kept in a tightly covered container. Use browned flour instead of kitchen bouquet or gravy master, both of which are nothing more than overpriced food coloring. A technique that separates the professional from the home cook is letting the meat rest. Often at home, all the food is waiting on the table for the dang pop-up thermometer to let you know it is safe to eat the bird. As soon as the thermometer appears Dad or Grandpa are hacking at the turkey, like a five year old at a birthday piñata. Instead, remove the meat from the roasting pan. Place it on a platter, loosely cover with foil. While its resting for fifteen minutes or more, you can transform the pan drippings into gravy. This will also allow you to finish sautéing your blanched vegetables or other last minute dishes without being rushed. Your calm demeanor and delicious food will make your guest’s think that you kidnapped Martha Stewart and you have her chained to a stove in a secret basement kitchen. Careful planning and pre-preparation can allow you extra time for what is really important around the holidays, more cocktails or, if necessary, it allows you to spend more time with friends and family and less time slaving over the stove. Try these side dishes that can be prepared ahead and finished at the last minute. Until next month, Bon Appétit. Have all items prepped ahead of time. Heat sauté pan over medium heat. Add bacon render. Add onions. Sauté 4 minutes until golden. Add carrots and garlic. Add Brussel sprouts. Toss well. Season with salt and pepper. Add stock. Simmer until stock is reduced by half. Swirl in butter.Toss with parsley. Serve immediately. In roasting pan, add 6 cups flour. Cook at 300 degrees for 1½ hours. Stir every 29 minutes until evenly browned. Cool. Store in air tight container in cool place for 6-8 weeks. Whip butter with brown sugar, cinnamon and minced shallots. Can be done 3 days ahead. allow to soften day of event. Lightly grease casserole dish with a little cinnamon sugar butter mixture. Toss sweet potatoes with salt, pepper and hazelnuts. Layer with butter. Roast at 350 degrees for 45 minutes, or at turkey cooking temperature. Remove. Toss with sage and more butter mixture if desired.